Though J. Allen St. John had painted a cover for the previous book, "The Warlord of Mars," in the Mars series, "Thuvia, Maid of Mars" was the first time he had been able to fully explore Barsoom with 10 illustrations, done in a variety of media. This image captures the otherworldly adventure in an iconic way that no other illustrator had done to that time. The original is in charcoal with white paint highlights and was printed in a sepia tone in the first edition. 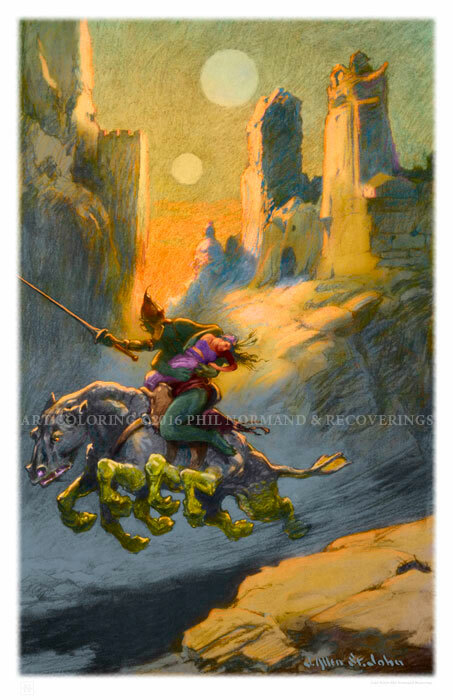 This colorization by Philip Normand presents the image in its proper setting as described in the book—early dawn in the dead city of Aanthor as the savage green Tourquasian chieftain Thar Ban steals Thuvia, Princess of Ptarth, away from her Dusarian kidnappers.